June | 2009 | Scenic Thingsville, US! Maybe I’m just a dog lover, but I think the guy above is cute — the previous winner was downright terrifying. Sorry about that…here, have a cutest dog in the world to cleanse your palate. The concept meeting started out fine, electing to use interesting stock photos, relevant to corporate and industrial law, to give the website a polished feel. After the wine coolers began to flow, the designers felt something was missing: an iconic, readily identifiable object. The law office is of Bryant Miller Olive needs something for people to recognize…what could it be? Lack of proper Giant Olive safety procedures left fifty three construction workers dead that fateful day. I’m just a bill, yes, I’m only a bill, and I’m sitting here on Capitol Hill. Well, it’s a long, long journey to the capital city. It’s a long, long wait while I’m sitting in committee, but I know I’ll be a law someday — at least I hope and pray that I will…but today I am still just a bill. Although, I beg to differ: a Dalek on keytar trumps cybermen guitarists. Sontarans with tambourines are somewhere in between the two, I think. Why is it funny? 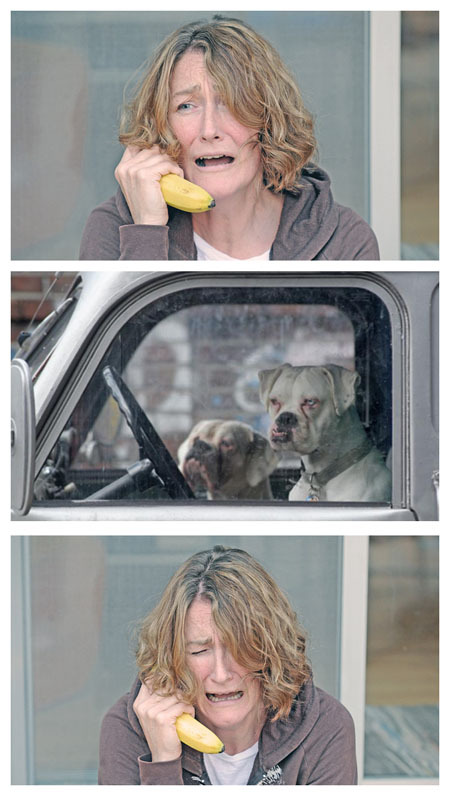 Tragedy, bananas, and funny-looking dogs in human situations. It’s a perfect storm of comedy! The record, of which there is one already, was broken by 2,510 blue-painted college students; the previous record of around 1,200 was originally held by the Irish, who were unaware of their record because they were more concerned about letting the color-blind guy buy body paint last St Patrick’s Day. A student was arrested for constructing the safety-reflective giant monster seen below. Before I saw the photo, I was ready for some stupid, sloppily-stacked heap, but his structure is excellent. Hopefully the N.C. DOT will keep it intact and use it to draw attention to construction zone laws; he’d be far better than the talking orange we have around here. More in his Flickr set.